"Don't confuse me with someone else!" Guerrillas are Kong-like enemies found in the Forest Maze in Super Mario RPG: Legend of the Seven Stars. Guerrillas are the strongest enemies in the Forest Maze, having powerful physical attacks at their disposal. Like most powerful enemies in the game (i.e. Reacher or Mastadoom), Guerrillas appear only rarely: usually one per battle. A stronger, yet physically identical enemy, the Chained Kong, appears later in the game. 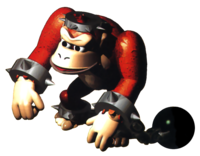 Aside from their chains and shackles, they appear visually identical to Donkey Kong, a connection that is made during their Psychopath. Their name is a pun on "gorilla" and "guerrilla warfare", which refers to a type of non-traditional combat where small, mobile parties attack larger, more organized militaries. This page was last edited on March 1, 2019, at 12:32.